I am a huge fan of Indian food. One of my favorite dishes is Kadhi Pakora. I never really knew what "Kadhi Pakora" meant, I just knew that I liked it. My friend, Seema, explained that pakoras are the fritters made from chickpea flour (AKA Besan or Gram Flour) that usually have vegetables in them, and the kadhi is the sauce or gravy that they sit in. Kadhi is apparently also served as is with rice or roti (a type of Indian wheat flatbread). 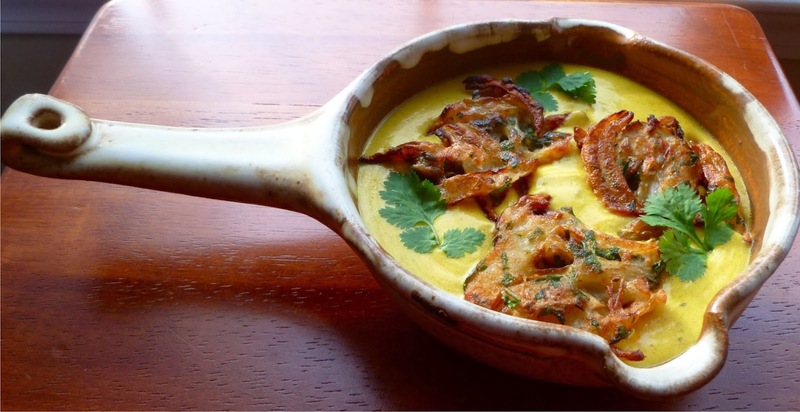 In searching recipes for this dish, it seemed like searching for a Kadhi Pakora recipe was something like searching for a cheeseburger recipe - although there are a few basic ingredients, the variations are seemingly endless. Some pakoras have no vegetables at all, and are more like a dumpling. Others are something akin to an onion ring with very little batter. The kadhi varied as well, with consistencies that ranged from a thin hollandaise consistency to thick (like pudding), some with a few spices and some with a list half a page long. I decided to make the pakoras with a minimal amount of batter - just enough to hold them together - and add them to the kadhi at the last minute to keep their crispiness. I have to say I was pretty happy with how they turned out. Give them a try - the recipe is long, but it's really not that much work, and the result is well worth it! Whisk first 6 ingredients (through methi leaves) in a medium bowl. Whisk in yogurt until smooth, then whisk in water and set aside for 30 minutes. Heat ghee in a deep skillet or sautee pan. Add cumin and methi seeds and stir until seeds start to pop and begin to darken, about 1 minute. Remove skillet from heat and let cool for a couple of minutes (this will keep the next additions from burning). Still off heat, add jalapeño, dried chile pepper, asafoetida, garlic, and ginger. Stir continuously to avoid burning ginger and garlic. Place back onto heat and slowly add yogurt-besan mixture. Bring to boil, still over medium heat, then turn heat to low and simmer for about 30 minutes while you make the pakoras. Whisk together besan, ajowan seeds, Garam Masala, and asafoetida in a small bowl. Place onion and potatoes in a medium bowl. Toss vegetables with the 1/2 teaspoon salt and let stand 20 minutes. Sprinkle with flour mixture and toss to coat vegetables evenly. Add water and stir well to combine. The vegetables should look like they are lightly coated with a batter the consistency of pancake batter. Stir in chopped cilantro. Fry a couple of tablespoons of the coated vegetables in about 1/8 inch of oil over medium heat. Cook until golden brown on one side, then flip and cook the other side. This should take 2-3 minutes per side. Set the cooked pakoras on a plate lined with paper towels to absorb excess oil, and when all of the pakoras are done, nestle them in the simmering kadhi until warm. Serve with additional cilantro as a garnish, if desired. wow its yummy i love pakora thanks for this recipe.